All of a sudden, fall is gone and winter has arrived. The mornings are bitter cold, the sun elusive, and there are only brown leaves and empty branches in place of the beautiful autumn colored foliage. We are at the beginning, with months and months ahead filled with brown, cold darkness! This past Thursday (which just so happened to be my birthday), I snuck out of work early, left downtown Omaha and drove 30 minutes west to Carol Joy Holling Camp. This is the Lutheran summer camp where I spent my early years, a place which was and continues to be formative for my faith journey. Each time I drive through the main entrance, I sense that this is a place set apart where the Spirit is very much alive. A tiny bit of the magic disappears during winter. The trees are bare, forests gloomy, lake still and quiet. During summer camp, there are bright, green trees and the sounds of laughter and singing echo throughout the site. But now it is quiet – very quiet. I was at the camp for a Board meeting – a pretty exciting way to spend a birthday afternoon! But the meeting was fine – we heard good news of the many ways camp continues to change lives. As we finished, I realized I had just enough sunlight for a short walk. The wind was light and the sun out; it had turned into a lovely afternoon. I stepped out of the office building and towards a familiar path in the trees. I was happy for the opportunity to walk in the woods, yet disappointed that everything was so brown and bare, that I had only a small amount of time, and that I was by myself – on my birthday. Almost reluctantly, I take my first step onto a small path and instantly see a cross. I stood there quietly, staring at this mark of my faith in the midst of what seemed from the outside to be dead and dying. Yet this cross was there. Through changing seasons, action-packed summer months, desolate winter alone-ness, through dying and rebirth – all along, the cross is there. Luther’s words are a reminder for ourselves, for our community, our churches, our country, our world, that something which is not good, which does not “shine and sparkle” might still become good; might get better. As believers of Christ on the Cross, we declare that God chose to be with us in our joys and our suffering. Three short steps into my hike, and I was filled with this theological reflection of how God offers hope to a humanity clouded by despair! 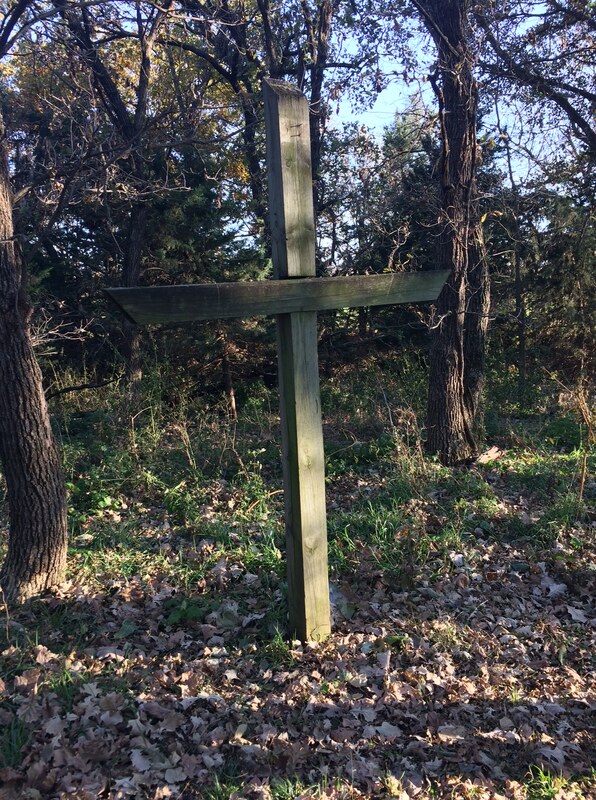 I began to search for crosses in the woods. There are SO many signs of our God who is with us. Like the cross, very present within the depths of the decaying and dormant woods, we too know Christ is present in our hopeless situations.